If the image does not display use this link to read the original blog with images. Here is the first chapter of my upcoming book, The Dragons of Sheol. I like books that begin quickly, with a good deal of action right away. I hope you enjoy it. Dave glowered at the diminutive figure darting and swaying before him like a jack-in-the-box. Wiping the sweat from his swollen left eye, Dave mumbled to himself, “Come here Brandor, you half pint. All I need is one touch with my quarterstaff and you’re finished.” Not for the first time in this match, Dave wished he had picked a lighter weapon. Maybe then he could land a blow. His fellow students at Gur Academy stood in a circle around the two combatants, cheering them on. “Brandor, stop with the bouncing around. You make my eyes tired,” chimed in another. Dave fixed his eyes on Brandor’s, whose slender form was seventy pounds lighter than Dave’s solid, well-muscled body. He could smell Brandor’s self-confidence. Then he saw his opponent turn and smile at one of the young women watching them. Dave seized on the moment and rushed in, raising the end of his staff for a quick blow. Brandor evaded the swing easily, crouched and swung a low, sweeping blow at Dave. Dave felt a sharp crack on the side of his leg. It sent him sprawling to the ground, gasping in pain. He moved to get onto his feet. “Stop!” came the order from the Academy commandant. Brandor was poised to drive his quarterstaff into Dave’s head, as Dave crouched, vulnerable, on the ground. Dave dug his fingers into the sand of the practice ground. He could smell Brandor’s indecision. He could sense his hatred. “You’re lucky, skork. You don’t belong here with us. Go back to your own kind,” said Brandor through gritted teeth. Sullenly, he pulled his weapon back from the killing blow, then stood at attention, facing the commandant. Skork was the pejorative used to describe all bent and broken peoples from the zombie-like Apemen, to the Halfmen, and even to Dave’s own people who were inferior to the Ancients in longevity, speed, and several other attributes. Brandor was a young nephew of Arachodor, a member of the ruling Council of Thirteen. Arachodor had objected strenuously to Dave’s acceptance into Gurundarian society, after Sirona the healer had called him back from death. In saving him using a healing plant tuned only to Ancients, Sirona had changed Dave’s body from that of a Lesser Man (what Ancients called ordinary people from earth) to that of an Ancient. I wonder if Brandor would have killed me if the commandant hadn’t stopped the match? No one’s been killed during Academy combat training in more than a hundred years, Dave thought. He stood up gingerly and limped toward the circle of onlookers. The Academy stood high on the western slopes of the Barrier Mountains and he could see the vast expanse of Lake Tolbar shimmering in the distance. His wife, Arlana, came toward him. Clutching his right arm to support him, she walked with him away from the crowd. Dave was glad she didn’t talk about the fight. She had neither his strength nor toughness, but she was as fast as thought. She had deftly handled Brandor in a sparring match the previous week. She still had a bruise where Brandor had flailed out and “accidently” hit her when she had started to walk away after their match. Dave had planned to teach Brandor a lesson today—and hadn’t been able to touch him. The humiliation was almost unbearable. “Sounds easy enough,” said Dave. “Things are never easy when we’re close to the Skull Mountains,” said Arlana. “I wish we could get some leave and head home,” said Dave. “Shhhh, Dave. Keep your voice down,” whispered Arlana. Dave glanced over his shoulder, relieved that there was no one in sight. When they finally reached their quarters, Dave went out back to wash in the creek-fed shower. When he returned, he saw Arlana and Ferris, her cousin, in serious conversation. They looked up as he limped in. After Ferris left, Arlana looked at Dave as if she were deciding whether to tell him something. Arlana jabbed Dave in the shoulder with her quarterstaff. “Kree ah na koo! Stop joking. This is serious. In two days you could be out on the mountain slope without me to take care of you. How would it look if you got yourself killed? All the women would wonder if you went out looking for death to get away from me. Think of what that would do to my reputation.” They both burst out laughing. She knows how to handle me. She’s not just good to me—she’s good for me, Dave thought. They sparred for a couple of hours with only the occasional breather. Dave began to see what Arlana meant and started to anticipate her moves. Then Arlana showed him how to disguise his next move by deliberately attacking from a disguised defensive posture. The door opened and Ferris entered again. He was scowling. “So why the long face?” asked Arlana. It was getting late and Ferris left. Dave and Arlana began to organize their equipment for the trip. Dave tried on his living cloak, hung a small satchel containing a light gourd around his neck and strapped on his long belt knife, which he had named Skene Dhu. Dave had found his knife, along with his sword, Gram, in a blade tree near the Ancient fortress of Kellburg. Dave realized he needed a tie to fasten his sleeping blanket to his pack. He had some stout leather, which he had taken from the hide of a Rokash. He took out Skene Dhu and examined the blade lovingly. It had a lustrous blue sheen unlike any other metal blade. The bioengineered alloy of molybdenum-tungsten steel, protein spacer, and diamond fiber, cut through thick Rokash leather as if it were the thinnest of papers. He put the knife back in the metal-lined sheath and walked over to Arlana. “Princess, I want you to take this.” He held out Skene Dhu. She peered into his eyes, as if wanting to wrest his thoughts from him. Suddenly she relaxed, raised herself on her toes, and kissed him lightly on the cheek. “We’ll trade knives. Viper will look after you.” She handed him her knife and scabbard and then they both turned to organize their packing. Dave was exhausted. Grimbor had summoned him, to offer some extra help on using his sword after yesterday’s fiasco with his quarterstaff. Now after three hours, Dave was laboring and Grimbor didn’t even seem to be tired. Dave began to circle once more. Grimbor was shaped like a fire hydrant, with no waist. He was much shorter than Dave, but his shoulders were just as broad. Yet he was fast as well as strong. With his eyes fixed on Dave’s, Grimbor’s feet and sword moved in perfect coordination, with a grace and fluidity Dave wished he could match. After another flurry of exchanges during which Dave was barely able to evade and block the lightning attacks, Grimbor sighed and said, “Enough fer today.” Sitting down, he gestured to a space on the bench beside him and offered Dave a drink of water. Dave took a long pull from the water skin and handed it back to Grimbor. Grimbor’s eyes became hard. “It’s not Halfmen I be thinkin’ of. Fer a youngin, ye have many enemies, and to my way of thinkin’, Halfmen are not the most dangerous of ‘em. Watch yer back and practice yer forms every night when it’s safe to do so. Hmm.” Grimbor lapsed into thought. In the first book of The Halcyon Cycle, a risky physics experiment transports the island University of Halcyon to a new world. Meglir, a being of great power, is released from his prison and threatens Halcyon and the tiny refugee colony of Eleytheria. In The Battle for Halcyon, we follow the struggles of Dave, Al, Pam and Floyd with their Hansa allies as they work to stop Meglir’s army and find a way to return Halcyon home to its own space-time. Surprising new facts about the continent of Feiramar, her peoples, and her history unfold. A new menace, in league with Meglir, threatens from the east. Will Halcyon continue to follow its program of tyranny to establish a secular utopia? Can Meglir be defeated? Can the island University of Halcyon undo the dislocation and return home? 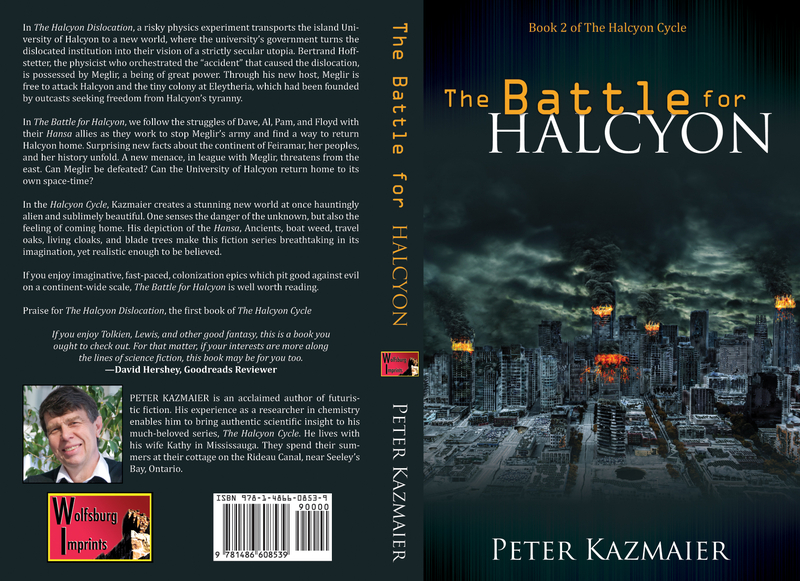 In The Halcyon Cycle, Kazmaier creates a stunning new world at once hauntingly alien and sublimely beautiful. One senses the danger of the unknown, but also the feeling of “coming home.” His depiction of the Hansa, Ancients, boat weed, travel oaks, living cloaks, and blade trees make this fiction series breath-taking in its imagination, yet realistic enough to be believed. Lovers of imaginative, fast-paced, colonization epics, which pit good against evil on a continent-wide scale, will find The Battle for Halcyon well worth reading. Ask for it at your favourite book store or on-line vendor. Check at Chapter-Indigo, Amazon, or Google-Store. Why not send me a note? I love to hear from my friends.